Nine Hong Kong democracy campaigners have been convicted on public nuisance charges for their involvement in pro-democracy rallies in 2014. The Umbrella movement demanded greater autonomy from mainland China. It is not clear when the group will be sentenced. The activists convicted include the trio who founded the pro-democracy "Occupy Central" movement in 2013, sociology professor Chan Kin-man, 60, law professor Benny Tai, 54, and Baptist minister Chu Yiu-ming, 75. The Occupy Central movement joined the Umbrella Movement in 2014 in demonstrations calling for free elections that brought parts of Hong Kong to a standstill. 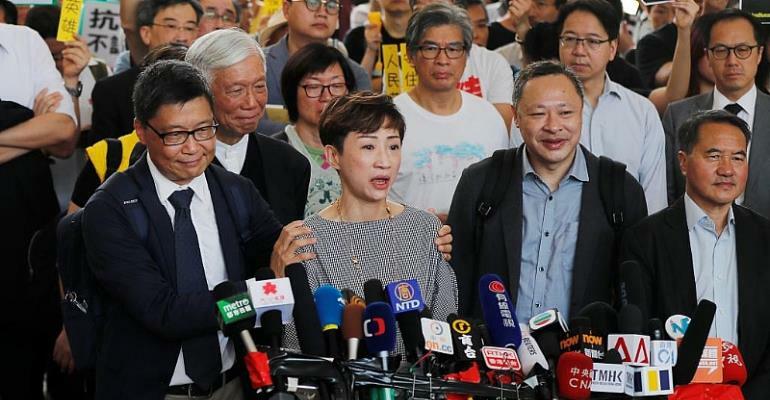 The others, convicted of the rarely used colonial-era public nuisance charges, are pro-democracy lawmakers, Tanya Chan and Shiu Ka-chun, former student leaders Eason Chung and Tommy Cheung,activist Raphael Wong, and former lawmaker, Lee Wing-tat. The nine defendants, known as the “Umbrella Nine” were the last group of demonstrators to be charged over the 2014 protests. The nine activists were tried under Hong Kon's common law, which carries a much steeper sentence than statutory public nuisance laws. Each protest leader could now face up to seven years in jail, rather than three months had the charges been brought under statutory law. In his verdict, Judge Johnny Chan ruled that the 2014 protests, which took over key intersections for many weeks, were not protected by Hong Kong's free speech laws because the demonstrations impinged on the rights of others. At the trial, prosecutors argued the mass protests had caused a “common injury done to the public”, who had been affected by the blockage of major roads. Chris Patten, the last British governor of Hong Kong, said it was "appallingly divisive to use anachronistic common law charges in a vengeful pursuit of political events which took place in 2014." Human rights group criticised the convictions saying the use of vaguely worded public nuisance laws would have a chilling effect on free speech in Hong Kong. "Hong Kong courts, by labelling peaceful protests in pursuit of rights as public nuisance, are sending a terrible message that will likely embolden the government to prosecute more peaceful activists," said Maya Wang, a senior China researcher at Human Rights Watch. Judge Chan denied his ruling would impact the ability of Hong Kongers to protest. The "Umbrella 9" were greeted by a large crowd of cheering students outside the courthouse in Hong Kong's Kowloon district on Tuesday morning. Addressing the crowd, professor Chan Kin-man said he had "no regrets" for what he has done. Adding "we are more concerned bu how this movement will be recognised by the people of Hong Kong."